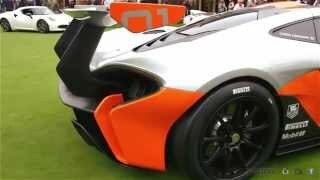 At the grand Pebble Beach Concours d’Elegance event McLaren unveiled its all new McLaren P1 GTR Concept 2014. The sporty, track-focused concept is said to be production-ready in 2015. While unveil officials expressed their speculation of McLaren P1 GTR to be the world’s first choice for every track driver. Let us have a closer look to what makes them so confident with their calculations. Not much f information has been released in context to the interior of McLaren P1 GTR Concept 2014 but looking at its well engineered performance oriented sporty exterior we have some calculations based on rules. Being a track focused concept, it has to come with a driver oriented cabin, which include, well harnessed bucket seats in front of multi function sports steering wheel. Without much of mind-diverting inclusions, an instrument providing all vital information about the car to drive, high security roll cage and yes though no one expects it but an escape zone in case of accident. Apart from these we expect extensive use of carbon-fiber and other lightweight materials that will significantly contribute to lessening the weight and thus improving performance of McLaren P1 GTR Concept 2014. 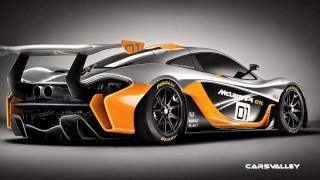 Exterior of McLaren P1 GTR Concept 2014 is very well planned and designed keeping in mind superior handling, performance and optimized driver engagement on track. Starting with the front fascia of McLaren P1 GTR Concept the aggressive wheel arches get very well complemented by front splitter. Proper airflow to engine and brakes has been kept in mind while designing the exterior, behind the front wheels monoCage chassis has been integrated made from carbon-fiber, wheel arches encapsulates radiator ducts and also an aerodynamic blade that cleans the air around the wheel. Extensive use of carbon-fiber has been done in making the exterior. Another commendable addition is with the lightweight 19” wheels featuring quick release center locking nuts, that’ll take less time to change and thus reducing time waste during race. Rear fascia of McLaren P1 GTR Concept 2014 comes with massive wing fitted with Drag Reduction System. 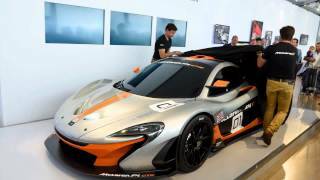 Though not much has been revealed about performance of McLaren P1 GTR Concept 2014, apart from its 3.8 Liter twin turbo V8 engine delivering total output of 986 hp. With this power and the aerodynamic efficiency we expect McLaren P1 GTR Concept 2014 to reach a top speed of over 220 mph and 0-60 mph sprint to be in less than 2.5 seconds. 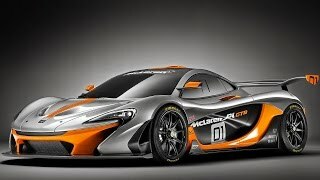 However final information will be released once the McLaren P1 GTR comes as production ready model.